Why don’t my Annual Baskets & Planters Look Good All Season? 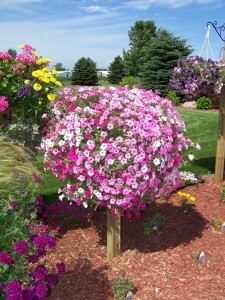 For many, growing Hanging Baskets, Planters, or even annuals in landscape design is a task they just don’t know if they want to take on again this year. Last season their annuals just did not ‘last’ all summer. They looked good for a month or so after they got home but then went down hill from there. Many people will say ” but I watered every day”! If the above statement sounds like something that you may have running through your head, let me give you a few simple steps to succeeding at growing annual baskets and planter. #1 “But I water every day” to that statement I would first ask you, ” When you are watering do you water enough that you see the water running freely from the bottom of your basket/planter?” If not, I dare say that you are under watering your plants. If the water is not reaching the bottom of the pot your roots are not able to evenly drink up the water that they require. #2 My question to you is ” How often do your fertilize? Have you fertilized at all?” At Garden Crossings we recommend fertilizing your baskets/planters at least every other week, although weekly would be great with a low concentrate water soluble fertilizer. We recommend and personally use Proven Winners Water Soluble Fertilizer. The reason you need to fertilize your plants is because every time you water you are flushing a little bit of the nutrients/fertilizer from the pot. Like humans, plants need nutrients to perform to their highest standards. The fertilizer will help keep your flowers flowering and your foliage nice and green. You may even feel like you have a plant on steroids if you keep up on the fertilizing. If you do start to feel like you have ‘too much’ growth we recommend giving your plants a ‘haircut’ or a trim to keep them nice and full. Don’t cut back on the fertilizer because this is keeping your plant healthy. Now if you are thinking there is no way I am going to fertilize every one to two weeks we do have another option for you. That option is a continuous release fertilizer. Generally we recommend Continuous Release for ground planting as it will not flush away in the ground as fast as in a basket. But if you are feeling like “I will fertilize, but I am only going to do it one time” , This option is better than nothing. And Lastly #3 if watering is a problem for you and you feel like you just can’t keep up or are always forgetting to do it, we recommend installing an inexpensive self watering system. We have found a system that is easy to use, and does a great job, it is the Waterwise System from Proven Winner. Basically all you need is the kit and a scissors. Here is a link to show how simple and easy it is to install the Waterwise System. You can go away on vacation for a week and come home to beautiful flowers. Green is popping up everywhere. 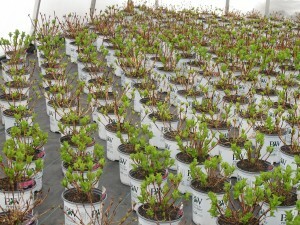 Hydrangeas are just starting to wake up as their foliage appears. Soon there will be a sea of pinks, purples, and whites everywhere. I can’t wait!! A reminder for those of you who don’t like the ‘ugly sticks’ sticking up in the garden once everything else starts to look nice. Do NOT cut back the sticks as in most cases that is where your summer blooms are going to come from. Planting & Maintenance: Hydrangea are easy to grow and require only a few routine maintenance activities. When planting, the top of the root ball should be level with the soil surface. Water them thoroughly after transplanting. Most varieties form their flower buds in the late summer for the following year. They should only be pruned when the flower heads begin to fade, otherwise you’ll risk removing next year’s flowers. When pruning, remove spent flower heads and prune back other shoots to encourage branching and fullness. Although the coloration of the flowers is influenced by the soil pH, it is actually the presence or absence of aluminum that affects flower coloration. If aluminum is present within the plant, the blooms will be blue and if it is absent, the flowers will appear pink. The pH influences the availability of aluminum for uptake by the plant. When the soil is acidic (pH around 5.5) aluminum is generally more available to the plant and blue flowers result. Conversely, when the soil is alkaline (pH near 7.0), the availability of aluminum is decreased which leads to the formation of pink flowers. If blue flowers are desired, it may be advantageous to apply drenches of aluminum sulfate (one tablespoon per one gallon water) around the plant in the early spring. Avoid getting the solution on the leaves because foliar damage may result. If pink flowers are desired on Hydrangeas planted in acidic soils, it will be necessary to increase the pH by drenching the soil with hydrated lime (one tablespoon per on gallon water) in the early spring. The application of 3 to 5 inches of organic mulches will help retain moisture and decrease the occurrence weeds throughout the growing season. Hydrangeas grow best if they are fertilized regularly. Regular additions of organic matter, such as organic mulches, will often suffice. Otherwise, a slow release, balanced fertilizer applied once or twice per year (in the late spring and mid-summer) will provide adequate nutrition. Does this sound familiar to you? There are a few factors that may come into play with this statement that I will try and help you with. The first is, most people underwater their hanging baskets and planters. When you water your baskets/planters you need to make sure that you see a constant drip of water coming from the bottom of the pot. If you do not see the water flowing through that means that the water has not soaked all the way down to the bottom of your soil. If you soil does not get completely wet this will lead to the plant drying out faster. Another factor is wind and heat. When your planters are exposed to a windy location this will tend to dry them out faster. Also the heat from the hot sun will deplete the water much faster. And lastly there are some plants that are just plain thirsty! If you have Bacopa or Lobularia for example you will want to keep your baskets well hydrated for to keep them looking good. The i3 planter can help you keep your baskets irrigated all summer long for great looking baskets. And as an added bonus they also have lights to keep your beautiful plants light up at night to show off to all your neighbors. Need Help Choosing the Right Plant for Your Location? Let the EasyBloom™ Plant Sensor Help you out! Want to know what to grow? Want to help a sick plant? Can I grow tomatoes on my patio and parsley in my windowsill? How can I get my hibiscus to bloom and my ficus to stop drooping? How can I find new flowers for my yard this year? How can I stop killing plants and wasting money on landscaping that dies? How can I end gardening by trial and error? The #1 selling garden tool, EasyBloom™ Plant Sensor. Put the EasyBloom™ Plant Sensor anywhere, inside or outside, where you want to grow a plant or have a plant you want advice on. The Plant Sensor will measure sunlight, temperature, water drainage and humidity. Plug the EasyBloom™ Plant Sensor into the USB port of your PC or Mac. EasyBloom.com™ adjusts the raw sensor data with your local growing zones, climate, and hourly weather. From our 5,000+ plant library, we’ll recommend what plants are best for your spot and how to care for them. If you already have a plant, the Plant Doctor will tell you what to fix (and what you’re doing right). Use again and again, inside and outside. You are currently browsing the archives for the Cultural Care category.